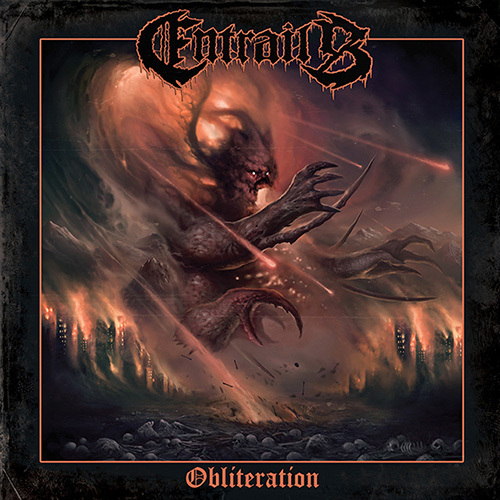 Swedish death metal overlords, ENTRAILS, will unleash the putrid fruits of their newest studio offering this May via Metal Blade Records. Fittingly dubbed, Obliteration, the follow-up to 2013′s Raging Deathfull-length was tracked by guitarist Jimmy Lundqvist at his own “Bloodshed Studios” and mixed and mastered by legendary musician/soundsmith Dan Swanö (Edge Of Sanity, Bloodbath, Aeon, Hail Of Bullets etc.) at Unisound. Featuring ten mangled tracks of sonic malevolence, Obliteration carries on the torch of true, old school Swedish brutality. Sample the sonic severity of the third cut, “Beyond The Flesh,” at metalblade.com/entrails. Boasting members of Birdflesh and General Surgery, ENTRAILS celebrate the teachings of Dismember, Grave, Entombed and Tomas Skogsberg’s Sunlight Studio alumni with a mutinous air raid of buzzsaw riffs, bestial vocal tirades, earth-rumbling rhythms and repugnant tales of suffering, doom and the undead with the expert brutality of their forefathers. The band was initially forged in 1990 by Lundqvist but disbanded prematurely due to his dissatisfaction with their initial demo recordings. Half the lineup went their separate ways while Lundqvist continued to write music until 1998, when ENTRAILSofficially went dormant. It would be a full decade before the band would ascend from the grave when Lundqvist found the band’s early recordings in an old tape collection and decided they deserved to be released as they should have been originally. With modern recording technology, the first twoENTRAILS demos — Reborn and Human Decay — finally took shape. Dubbed “one of the more vital and warranted demo collections to be made available” by Metal Injection in an 8/10 review, ENTRAILS dropped Resurrected From The Grave – Demo Collection last summer. The eighteen-track collection delivers the band’s Reborn and Human Decay recordings – the now infamous demos that started it all in one venomous helping. And now comes the time for a new chapter in extremity with the audio disease of Obliteration. Obliteration will see release via Metal Blade Record on May 15, 2015. For preorder bundles, visitmetalblade.com/entrails.